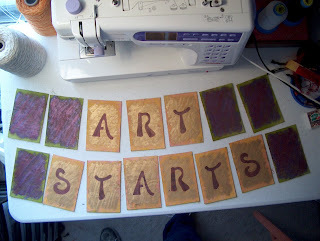 I'm working on this sign for the store, it's called Art Starts. It is muslin fabrics that have been ironed to a pelmet (I think it is) that has the fusible on both sides. Now I plan to stitch it, add stitched rat tail to the edges of each card, add brads to the corners and wire each panel together. Art Starts, which Loretta thought up for me as she did NOT like the name Make it And Take it, is for our lunch our customers that want to try out the many techniques we use in the studio. Problem is most folks are tight on time, lunch hour, and cash. So we have devised a method for partially producing what will be a finished piece for them, like ATC's and Fabric Postcards, and they can have a blast in 30 minutes or less. So me, being a fiber artist and all, decided to NOT produce "another" paper and laminate sign, via my computer, and decided that it was time to make the signs out of fibers instead. I stenciled the letters on with shiva paintstiks and a stencil brush. I"m quite proud of myself this is my first time stencilling on fabric and I was able to get crisp letters! Yay. I must say that this is way easier than stencilling on a wall!! !